chasing each other around my chive plants during a brief dry spell). of it in blossom if the sun ever comes out again. "Vardy, you reading lolcats?" She peered over the edge of his computer screen. He looked at her without warmth. "I can has squid back?" she said. "Noooo! They be stealin my squid!" When I read the above passage in China Mieville's Kraken I immediately knew I had to make a lolsquid for it. And, yes, I know it's not the most awesome lol ever made, but I did use a picture of the actual giant squid on display at the Natural History Museum (the one that goes missing in the novel) so I feel I should get some points for that! Being a little disheartened by my previous Nordic Challenge reads, I chose to seek solace in my library's cookbook collection. 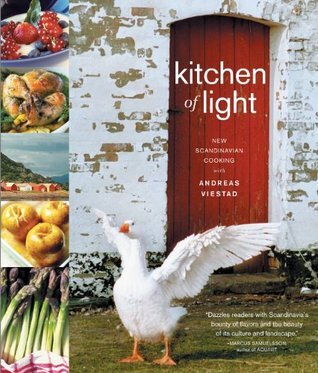 There I found, among many tempting titles, Kitchen of Light: New Scandinavian Cooking with Andreas Viestad. While I do not know that a cookbook makes an acceptable reading challenge selection, I really must tell you to read this book. It's beautifully put together with lavish photographs, lots of little stories about Viestad's life in Norway, and so many excellent recipes. Prior to reading Kitchen of Light, I knew nothing about cookery from that part of the world and wasn't sure what to expect. Now that I've dabbled a little and enjoyed what I've tried, I look forward to trying out other cookbooks -- Helene Henderson's The Swedish Table and Trina Hahnemann's The Scandinavian Cookbook most especially. Some of you already may be familiar with Viestad from his PBS program New Scandinavian Cooking or its sequel series Perfect Day. If so, I am extremely jealous of you! I missed it on PBS and the series' are no longer available on DVD. (I know, I know ... too much gardening, not enough reading! Well, it will be July before you know it and I'll be holed up with a book in front of the air conditioner while my garden crispifies under the relentless summer sun.